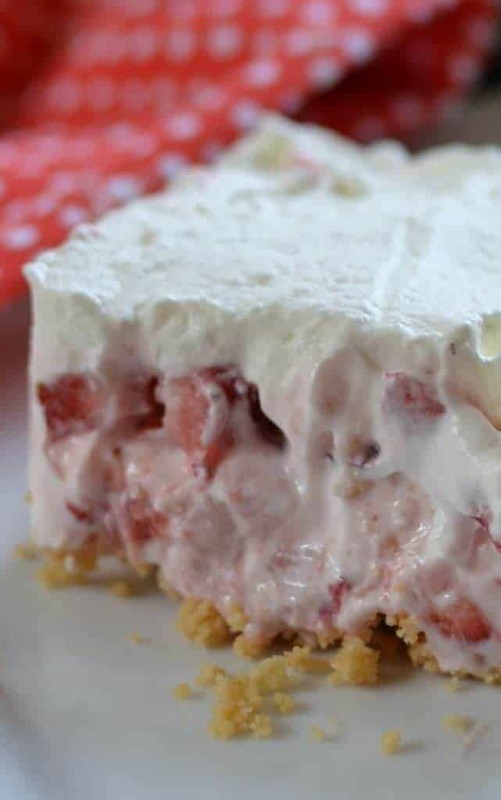 Strawberry Lush Cake brings fresh strawberries, cream cheese, whipped cream and sour cream together in a luscious no bake dessert. 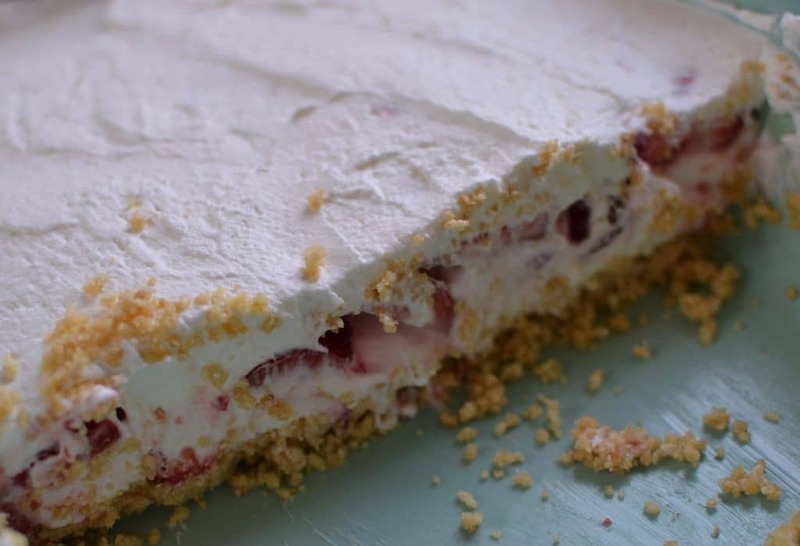 It is the perfect spring and summer dessert for potlucks. family reunions, graduations and patio parties. Are you ready for summer? It feels like it is here already. Are you doing any entertaining? Fresh strawberries are coming in really sweet and what better way to celebrate the summer than with a strawberry dessert. This Strawberry Lush Cake is out of this world good. You are going to love it! I mean love it! It is perfect for all your summer dessert needs. This no bake beauty comes together real fast yet tastes like you spent hours preparing it. It is so delicious you will be trying to lick your plate when no one is watching! Trust me I have seen it out of the corner of my eye! We are huge strawberry fans here. Are you? This Strawberry Lush Cake is a family and friend favorite and is always one of the first desserts gone at parties and family reunions. Put the ingredients for this scrumptious dessert on your grocery list today. Your family and friends will be singing your praises. I can not and will not be personally responsible if you have seconds or even thirds! This cake is a must try! You will be sneaking out of bed in the middle of the night to get just one more bite! Don’t do it! They will hear you!! Spray 8 x 11 inch casserole dish with nonstick cooking spray. Pulse oreos in food processor until crumbed. Combine with melted butter. Press into casserole dish evenly and place in freezer. In stand mixer combine cream cheese, sugar and orange extract. Mix on medium high until well combined and creamy; scraping the sides. 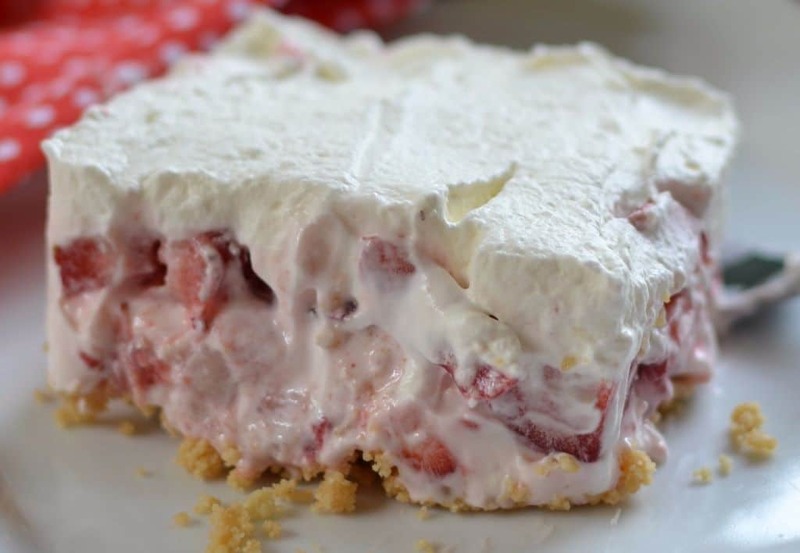 Fold in sour cream and chopped strawberries. Evenly spread over the cookie crust. Freeze for 1 hour. 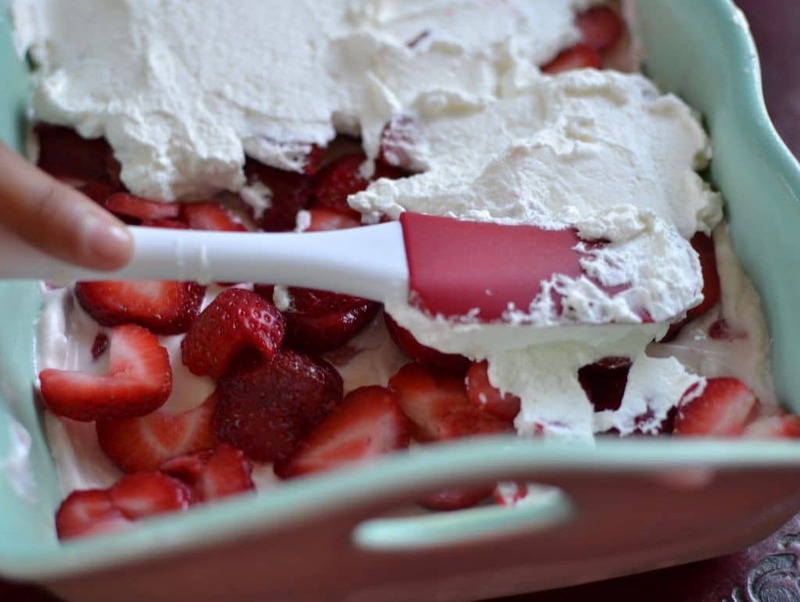 Add sliced strawberries evenly over dessert and place back in freezer while you make the whipped cream. Add whipping cream & powdered sugar to mixing bowl. Beat just until stiff peaks form. Spread evenly over dessert. Serve immediately. When whipping cream it is helpful to put your mixing bowl and beater in the freezer for 15 minutes prior to making. You can make this in a 9 x 13 but I would increase the Oreo cookies to 25 with 4 tablespoons of butter and add 3 cups of sliced strawberries. 0 Response to "Fresh Creamy Strawberry Lush Cake"